We are Moving Our Resources Everywhere providing access to library services in the rural areas of the county and to citizens who face obstacles in accessing resources. Materials available for checkout, laptops available for use, free WiFi, reference assistance, online databases and resources, printing and copying services! The BCLS collection contains over 260,000 items: e-Books, e-Magazines, Music CD’s, DVD’s, Audio Books, Kids’ Learning Tablets, Playaway Audio Books, and the new GoChip Beam. PLUS the latest Adult, Young Adult and Children’s Books! If you are looking for a particular item, just ask the M.O.R.E. staff how to place a hold. 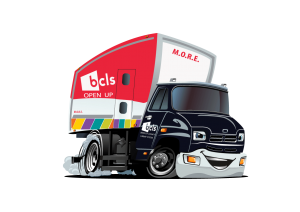 Meet MORE, BCLS’s New Mascot! Come see me and my friends on the bookmobile to learn more about how my story begins and what adventures I have planned.